What is this resource about? Learn the Case-Based Method and see how this method was used when Applying UDL in Bridge STEM OERs. Explore an Example within a course and the accompanying Sample Media Case Segment. Lastly, learn how to Produce Your Own Media Case Segment. Why is this important for higher education? Cases are representations of real-world situations and often represent a step before learning by doing. This helps to support the development of knowledge, skills, and practices that can be applied in the workplace. Cases become more effective for all learners if they are designed according to the principles of multiple means of representation, action and expression, and engagement (Universal Design for Learning). Cases simulate a situation that learners can experience independently or socially. When a group of learners analyzes a case together, they must tease apart the many factors that generated the situation and consider how they would respond if faced with the dilemma presented. Because cases offer the perspectives of different individuals, they allow learners to see that problems must be framed and resolved by people who often have different interests, values, and emotions around various issues.3 Cases are used to support critical thinking skills and produce professionals that have the knowledge they need to act. This section refers to a STEM Bridge Open Educational Resource (OER), created by the National STEM Consortium in partnership with the Open Professionals Education Network (OPEN) — a collaborative effort between CAST, Creative Commons, the Open Learning Initiatives at Stanford and Carnegie Mellon, and the Washington State Board for Community & Technical Colleges. This work was funded by the Gates Foundation to support services to grantees of the United States Department of Labor Trade Adjustment Assistance Community College & Career Training (TAACCCT) program. As discussed in the example section below, visit the STEM Bridge Open Educational Resource (OER) for a full overview of the course, or enter the STEM Readiness course directly (choose to create a free account, or proceed without one). Dorothy Leonard, who teaches the case-based method at the Harvard Business School, suggests that cases are ways of hypothesizing, that hypothesizing helps memory, and that memories are usually visual.4 Developing multimedia cases that use visual media to show a workplace environment or how someone uses a skill in context seems a natural way to help individuals to incorporate visual memories into what they are learning about. In the National STEM Consortium OER development effort, video is often used to convey information instead of text. For example, algebra skills are taught using a case about Jay who is interning at an electric vehicle factory. The case uses videos and images of Jay using algebra to measure car parts and this allows the learner to visualize algebra in context and tangibly see its relevance for their course of study Since reading is not a targeted skill in the course, it makes sense to use video to lessen some of the demands on students with regard to decoding text. However, visual and audio media will not be optimal for all learners, such as those who are visually or hearing impaired, and therefore transcripts and closed captioning are provided for each multimedia case segment. Throughout the curriculum, any visual representation of information, such as an image, has an alt tag and/or a long description that a screenreader can use to voice what it depicts. 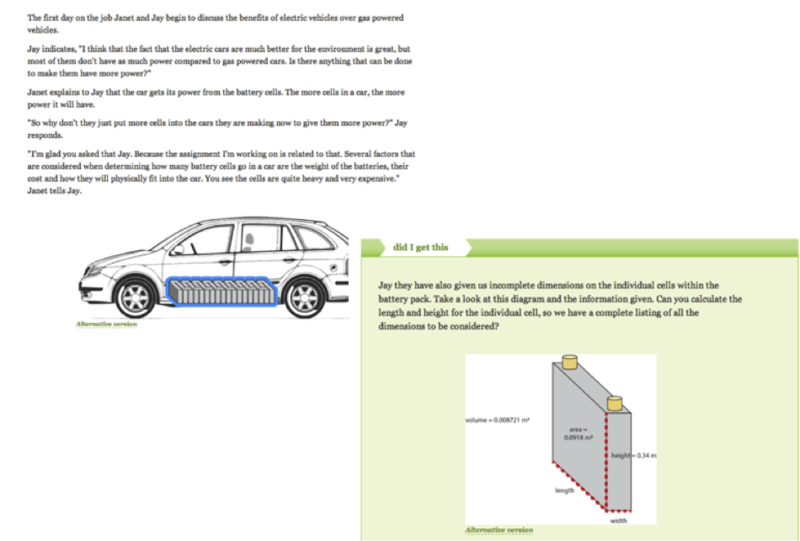 This screenshot from the STEM Bridge course is taken from a video in Module 7: Jay and Electric Vehicles. 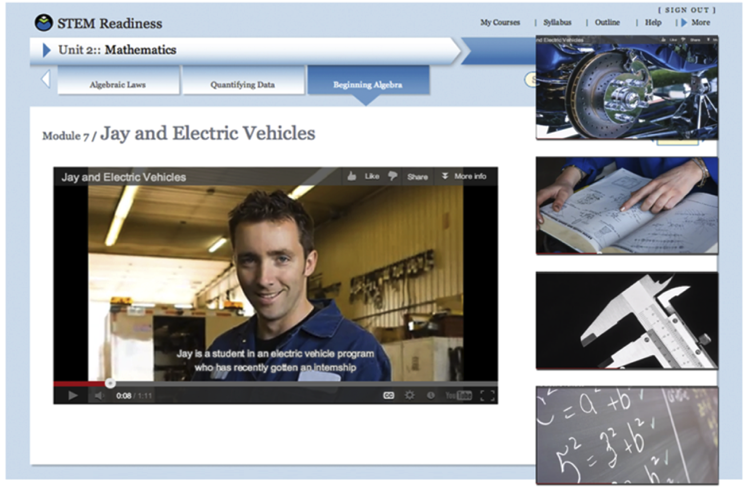 At the top of the screen, the page title and menu show that this is “Beginning Algebra” section under “Unit 2: Mathematics.” The video “Jay and Electric Vehicles” is shown in the center of the page and “Jay,” a young man wearing a blue industrial work suit, is shown on the screen. The closed caption on the video says “Jay is a student in an electric vehicle program who has recently gotten an internship.” On the right side, four additional, smaller screenshot images from the video case are also shown: an electric car part, a manual with car parts diagrams, a metal caliper measurement tool, and algebraic equations written on a board. Representation is not only about providing alternate media to make sure that all learners can engage with the materials; it is also about providing support for higher-level recognition tasks by providing options for comprehension. For example, learners need to able to perceive the relationship between information and their role as a student, as well as their future career choices or areas of future study. This kind of comprehension “depends not upon merely perceiving information, but upon active ‘information-processing skills’ like selective attending, integrating new information with prior knowledge, strategic categorization, and active memorization”.5 Well-designed representations of roles and practices can help learners connect new knowledge to their actual performance in the workplace. To aid comprehension, the STEM Bridge course showcases a wide range of people with different abilities, weaknesses, hopes for their careers, etc. This helps activate or supply background knowledge, guides information processing and visualization, and maximizes transfer and generalization across contexts, to allow a wide range of learners the opportunity to connect their learning with their career choices. The content of cases provide a great opportunity to illustrate various pathways for how individuals with different characteristics may accomplish their work tasks and their larger career goals. Similarly, interviews with people in an industry, profession, or particular work setting should reflect different perspectives on the work and how to be successful at it. In this way, students can learn that there is not one type of person that becomes a technician or engineer and this can be especially motivating for students that come from groups that are particularly underrepresented in a profession. In addition to problem sets on algebra skills in the STEM Bridge course, learners also solve real problems by completing formative assessment activities embedded into the case-based curriculum. In the screenshots below, note that there is some variety in the methods for responding to questions, and that hints and targeted feedback encourage the learner to develop fluency through graduated levels of support. This screenshot shows two images from the OPEN Bridge course from the following integrated activities section. The image on the left shows a reading passage of a conversation between the characters in the case regarding how many battery packs go in a car. Below the conversation paragraph, an illustration of a station wagon is provided to show the context with an overlay of 10 battery cells. The image on the right shows a follow-up activity: solving the question that was raised in the conversation. The question asks Jay to calculate the dimensions of an individual battery cell using an algebraic equation so he will be able to figure out the maximum number of battery cells that can physically fit into the car. An assessment question asks the learner to select one of multiple answer choices and also type in an answer. Feedback appears to explain if the answer is correct, and a hint button in the corner offers additional support. The use of cases in the STEM Bridge course provides a real-world representation of how math is used and encourages learners to operate on what they know in different ways. When cases are used alongside other pedagogical methods such as problem sets, written procedures, or lectures, they provide an alternate means of engaging with the content as well as with other students and instructors. Cases can provide ways of thinking about the context where new knowledge and skills will be used and in this way can help engage learners that need evidence of the real-world application of what they are learning. Teaching and learning through cases is an engaging method of knowledge transfer for many learners. It can also place heavy demands on learners to connect with other learners and with instructors in real time. Applying some of the strategies recommended under the multiple means of action and expression section above can help instructors address learner variability when leading case discussions and thereby engage more learners in the conversation. Visit the STEM Bridge Open Educational Resource (OER), created by the Open Professionals Education Network (OPEN) — a collaborative effort between CAST, Creative Commons, the Open Learning Initiatives at Stanford and Carnegie Mellon, and the Washington State Board for Community & Technical Colleges, funded by the Gates Foundation to support services to grantees of the United States Department of Labor Trade Adjustment Assistance Community College & Career Training (TAACCCT) program. As part of this work, OPEN co-developed open educational resources with the National STEM Consortium, a 10-college consortium Round 1 TAACCCT grantee that is developing career pathways in five STEM fields. The STEM Bridge program provides an accelerated pathway to help students bring their math, reading/writing, computer and critical thinking skills to the level necessary to take full advantage of the technical curriculum in one of the five programs (National STEM Consortium, Anne Arundel Community College Guidance Memo 07-2012). For the STEM Bridge OERs, the OPEN team chose to integrate digital media, UDL, and artifacts from industry partners in a case-based approach to instruction that represents the ways STEM skills are used in real life and industry. Enter the STEM Readiness course and then choose to create a free account, or proceed without one. Meet Jay -- a main character in the STEM bridge course who must solve the problem presented in the case. In this activity, the learner puts himself or herself in Jay’s role and solves the problem. In the segment below, Jay is interning at an electric vehicle plant and must use algebra to figure out how many battery cells can fit into an electric car. FEMALE VOICE: Jay and Electric Vehicles. FEMALE NARRATOR: Jay is a student in an electric vehicle program who has recently gotten an internship at ElectAuto. FEMALE NARRATOR: If Jay performs well in the internship, he will likely be hired on full time when he finishes his program at the community college. FEMALE NARRATOR: Jay’s supervisor has informed him he needs to be able to test a wide variety of electric car parts. He needs to be thorough and accurate. FEMALE NARRATOR: Many of the tests require him to use algebra as he conducts the measurements to find out if the parts work correctly. FEMALE NARRATOR: His supervisor knows that using algebra to do tests can be challenging, so she assigns an experienced worker, Janet, to work closely with Jay to make sure he succeeds in this internship. JAY: I know that I can do a great job in this internship. I’m excited to learn how to do these tests. I don’t know everything yet, but I’ll learn. FEMALE NARRATOR: In this module, we will follow Jay as he learns to test the electric car parts by using algebraic equations, improves his skills, and works toward being hired at ElecAuto, Inc. The video below describes how to plan, develop, and produce a universally designed multimedia case. How to Create a Multimedia Case in 10 Easy Steps: An instructional guide and development guide to help plan, develop, and produce a case. MALE NARRATOR: This video will provide an overview of how to plan, develop, and produce a case. MALE NARRATOR: Step 1: Choose a topic for your case and decide where it fits in your curriculum. MALE NARRATOR: With your industry partners, identify the most challenging aspects of practice found in the curriculum and decide how best to address them. MALE NARRATOR: Here is an example from a community college math course. Industry experts have expressed that budgeting is a key administrative skill in the workplace. Learning arithmetic by providing a real world context, such as budgeting, helps students develop applicable skills, not merely theoretical knowledge. MALE NARRATOR: Step 2: Set up a timeline for planning, development, and production, with UDL as the guiding framework. MALE NARRATOR: When developing a case, UDL should be considered from the outset when you create your development and production schedule. Make sure that the variety of media elements chosen to engage and support diverse learners can be integrated effectively and developed timely in the final product. MALE NARRATOR: Here is the timeline that was created for this community college math course. One thing to consider when creating your timeline is to block out time to review and revise your work. This includes testing your scenario with different students. MALE NARRATOR: Step 3: Create an outline for your case story. MALE NARRATOR: A case story outline includes a topic, setting, characters, a background story, practices, difficult aspects of practices, and the climax and resolution of the story. Each of these different components should be used to highlight the challenging aspects of the work in practice. For example, characters that are developed should be compelling as they confront challenges and learn lessons that are important for successful work in the field. MALE NARRATOR: Step 4: Write a detailed case and storyboard. MALE NARRATOR: Now that you have finished your case story outline you are ready to fill in all the details. Keep in mind your limitations, such as your budget and time when deciding which media will best portray the most critical aspects of your case in a UDL way. MALE NARRATOR: Step 5: Get feedback from all stakeholders. MALE NARRATOR: This includes curriculum developers, instructors, industry partners, and students. With all stakeholders, determine if the story components and chosen media are appropriate for the target audience. MALE NARRATOR: Step 6: Revise and finalize your storyboard. MALE NARRATOR: Apply the feedback from the stakeholders and make appropriate changes to all of the different storyboard elements. MALE NARRATOR: Additionally, make sure to revisit your timeline and adjust accordingly. MALE NARRATOR: Step 7: Produce the case media segments. MALE NARRATOR: This entails collecting and editing all existing desired media, such as images, sounds, or video, as well as recording and editing all original audio and/or video elements. MALE NARRATOR: Make sure to provide visual, audio and text alternatives, such as closed captions and audio descriptions. MALE NARRATOR: Be mindful of any technical requirements or limitations in your target course platform that might impact media production. MALE NARRATOR: Step 8: Test your case. MALE NARRATOR: Check to see that all produced media works properly in all technical settings in your target hardware, software, and network infrastructure. Involve students, fellow curriculum designers, and industry partners in testing your case. MALE NARRATOR: Step 9: Resolve any issues discovered from testing. MALE NARRATOR: Step 10: Embed the case in your curriculum. MALE NARRATOR: And you’re done! Good luck! This resource provided ideas for how to improve a widely used pedagogical approach: case-based learning. Addressing the principles of UDL when designing cases and when teaching with cases allows a greater number of learners to benefit from this method of transferring knowledge and better illustrates what work practices look like in the real world and how individuals carry them out. The example application of the UDL framework to OERs that use case-based learning and the short instructional video on how to build a multimedia case segment were meant to illustrate that using the case-based approach with UDL does not need to be costly or time consuming for professors or instructional designers; however, the benefits can be significant. 1Herreid, C. (1998). What Makes a Good Case? Journal of College Science Teaching 27(2). 2Ellet, W. (2007). The Case Study Handbook. How to Read, Discuss, and Write Persuasively About Cases. Harvard Business Press. 3Leonard, D. Lecture Presentation. The Art and Craft of Discussion Leadership, November 5, 2010. Harvard Business School Publishing Seminar. 6Bandura, A. (1977). Self-efficacy: toward a unifying theory of behavioral change. Psychological review, 84(2), 191. 7Ford, M. E. (1992). Motivating humans: Goals, emotions, and personal agency beliefs. Sage Publications. Multiple means of representation refers to the what of learning. Because learners vary in how they perceive and understand information, it is crucial to provide different ways of presenting content. Multimedia refers to the combination of several media (e.g., text, graphics, audio clips, video) to represent content concepts. A transcript provides a written version of content that has been presented in an audio, visual, or audiovisual format. Alt text (alternative text) is a brief description of a single image designed to be read by a screenreader as an alternative to that image. A long description is a more extensive description of an image, typically a complex image, designed to be read by a screenreader as an alternative to that image. 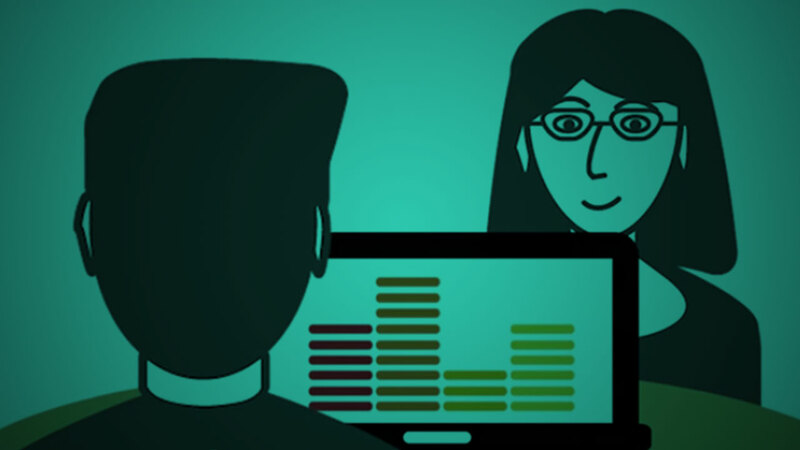 A screenreader is a software application that converts the text content of a computer display into speech in order to transmit the information primarily to blind or low vision users. Multiple means of action and expression refers to the how of learning. Because learners vary in how they express their knowledge, it is crucial to allow them to express what they know in different ways. Cases, in this context, are representations of real-life situations that simulate problem-solving experiences. Open educational resources (OERs) are any type of educational materials that are openly and freely available for use. Captions are words that are displayed on a screen to describe audio content.